The cervical spine is comprised of seven vertebrae, C1 through C7, which begins at the base of the skull and extends down into the thoracic spine. At each level, the vertebrae protect the spinal cord and work with muscles, tendons, ligaments and joints to support and give structure to the neck, as well as allow for flexibility in turning the neck from side to side and forward and back. C1 is the smallest vertebrae in the cervical spine and from there, the vertebrae get larger in order to provide more support to the neck and head. As a complex system, and due to the many forces and stresses placed on the neck through daily activities, cervical spinal conditions are all too common. Cervical degenerative disc disease is one the common causes of neck pain. About 25% of people with symptoms of this condition are under age 40. About 60% of people over the age of 40 have some degree of degenerative disc disease. Neck pain is often attributed to sleeping incorrectly, turning your head too quickly or trauma. However, underlying conditions could actually be the cause of your pain and suffering. Age, injury, poor posture and disease can lead to cervical spine degeneration. Sudden injuries such as whiplash due to an auto accident can also contribute to disc herniation and other injuries. When these conditions put pressure on the spinal cord, it can lead to nerve impingement, which will require surgery to decompress the nerves. Diagnosing a cervical spinal condition will be based on your history, symptoms, physical examination and the results of medical imaging studies. An experienced doctor can diagnose your condition through imaging studies such as a computerized tomography scan (CT scan) and magnetic resonance imaging (MRI). Who is a Candidate for Cervical Spine Surgery? Lumbar spinal surgeries were initiated in the 19th century following the development of anesthesia. Lumbar disc degeneration was a deep focus in the beginning of spinal surgery and the first laminectomy was performed in 1829. The first operation on the cervical spine was completed around 1925 when Charles Elsberg was one of the first to remove a cervical disc. In the early 1950s, cervical procedures were performed using a posterior approach. Decompression of the nerves was performed through large posterior incisions. These surgeries included laminectomies. Improvements in cervical spine surgery were revolutionized as physical examinations, diagnostic imaging and development of surgical techniques and instruments progressed. In the 1980s, there was a better understanding of the cervical spine, including how pathological changes could lead to instability. During this time, the introduction of the first cervical disc prosthesis was also developed. In the last 10-20 years, cervical spine surgery has advanced with the development of imaging testing as well as surgical implants. The advancements made in cervical spine surgery have allowed for a safer release of the spinal cord, vertebral fixation and the conservation of function. The goal of cervical spine surgery is to relieve the pain and resolve the underlying problem. This is often done through nerve decompression surgery. Decompression procedures work by removing any tissue pressing against the spinal cord or nerve, or by creating more space for the nerve tissue to remain unobstructed. Facets are joints in your spine that help stabilize your spine. However, misaligned facet joints can put pressure on a nerve. In many cases, growth called bone spurs can develop. A facetectomy involves removing part of the facet joint to reduce that pressure. A discectomy involves the removal of a portion of the intervertebral disc that is putting pressure on the spinal cord or radiating nerves. A discectomy may be performed as part of the treatment for spinal stenosis if the disc at the affected level is herniated. Posterior Cervical Decompression is performed from the back of the patient’s neck to remove bone spurs or enlarged ligaments that are compressing the spinal cord and nerves leading to the arms. This procedure is also employed to treat degenerative disc disease and facet joint syndrome. However, patients who have had previous cervical fusions with residual pain can also benefit from the Bonati Posterior Cervical Decompression. The Bonati cervical spine surgery is performed using local anesthesia and conscious IV sedation, allowing the patient to be comfortable, but awake, during the procedure. Patients are given the option to view their surgical procedure on a monitor, and to have a family member or friend present during the operation. After a brief period of recovery, patients are discharged from the Bonati Spine Institute, and return for a follow-up visit the next day. Your doctor will provide you with a complete explanation of what to expect during your surgery. Before your surgery, you may be asked to stop taking certain medicines or stop smoking. You will need to make sure you have a companion who can drive you and stay on the day of surgery and the first night. You will also want to ensure you have loose fitting, comfortable clothing. With a cervical procedure, it is recommended that you bring something that can be zipped up or buttoned rather than a top that could pull on your neck. Post-surgery, you will be prescribed a regimen of walking therapy and your surgeon will complete a follow-up consultation to determine if you require other surgeries. 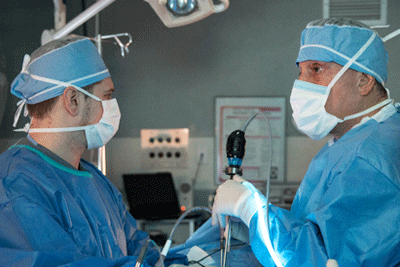 Procedures at The Bonati Spine Institute are outpatient, which means you do not have to be hospitalized overnight. The procedures allow for faster recovery so that you can get back to your everyday life as soon as possible. The formation of scar tissue is a common occurrence after “open” or fusion spine surgery has been performed. The formation of scar tissue is part of a normal healing process the body goes through after these spine surgeries, however, it can also become a source of pain and limited flexibility and mobility. Scar tissue that forms around the muscles, nerves, tendons and ligaments can lead to significant issues. As the tissue grows older, it contracts. As the scar tissue contracts, it can impact the surrounding nerves. The formation of scar tissue near nerve roots is called epidural fibrosis. Scar tissue is one of the common causes of failed back surgery syndrome (FBSS) after open spine surgery or spinal fusion. One of the important advantages of The Bonati Spine Procedures is that the procedures are done through a small incision and there is minimal dissection of muscle fibers unlike traditional spine surgery. This causes far less trauma to the tendons, muscles, ligaments, bones, joints and nerves of the spine, which in turn minimizes scar tissue formation after the surgery. In addition, due to the nature of these procedures the movement of the spine is preserved, therefore, the formation of painful scar tissue is greatly reduced. It should be noted that since there are no nerve endings in the scar tissue, it is not painful in itself. However, when it binds with spinal nerve roots with fibrous adhesions, it can cause pain. Since The Bonati Spine Procedures preserve the mobility of the spine, any scar tissue that might form does not get trapped between the tissues and therefore, will not cause pain. If you are suffering from a herniated disc, degenerative disc disease or other spinal condition, conservative treatments are available. For many, these alternative treatments can provide temporary pain relief and their symptoms may resolve over time.